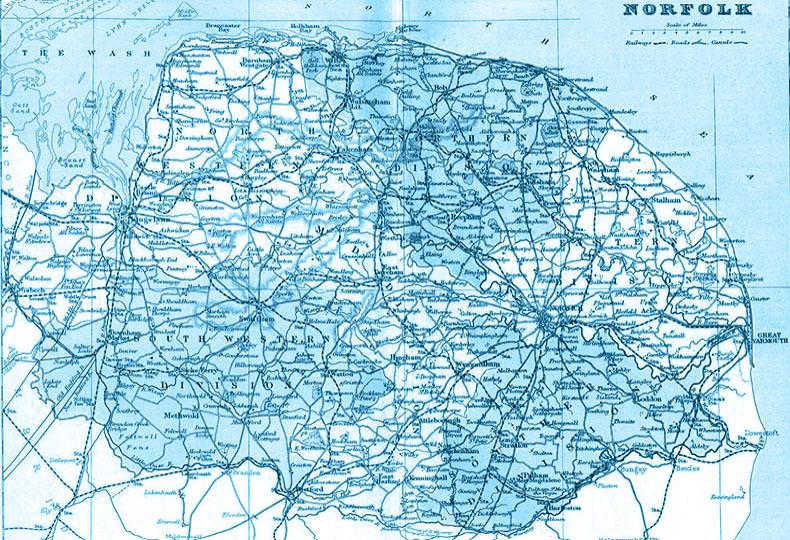 So… what do we know about Norfolk? Loved the place, Wroxham was my second home in my previous life. As well as being flat, quite a lot of it is more than a little watery. The residents should no longer be described as ‘normal’ by medical professionals. ‘The Singing Postman’ was born in Sheringham. ‘The Singing Sheringham’ was not born in Postman. AMANDA: At least I have good taste enough to refrain from making cheap gibes at Sibyl. ELYOT: You said Norfolk was flat. AMANDA: That was no reflection on her, unless she made it flatter. I studied in Naaarch and it ain’t flat! Neither is Norfolk. I did a cycle camping trip around the coast a few years back and whilst it isn’t the Peak District, it certainly isn’t Cambridgeshire flat. The cliffs along the coast path from Cromer to Sheringham are both scenic and very undulating. In Hunstanton and Great Yarmouth, Norfolk has two of the tackiest seaside resorts this side of Skeggy! Yarmouth is OK, Used to go the races there. Sa a few get put down. english acoustic folk,rock singer-songwriter who was raised in norfolk during his childhood. Pablo fangue,equestrian and popular victorian circus proprietor,whose 1843 poster advertisement inspired the beatles song,being for the benefit of mr. kite!,born in norwich. Cut off on three sides by the North Sea, and on the fourth side by British Rail. Can’t remember who said that, and I may be paraphrasing. @wiki. other notable people from norfolk. television presenter,who grew up in east wretham and went to school in watton. Sid kipper,norfolk humourist,author, songwriter and singer. Henry blogg,the U.K’s most decorated lifeboatman,who was from cromer. Howard carter,archaeologist who discovered tutankhamun’s tomb,childhood was spent primarily in swaffham. Location of Sandringham house, owned by Queen Elizabeth. Prince George had his first Christmas there but the Queen invited so many folk that some had to sleep in the servants quarters. Servants relocated to a homeless hostel in Kings Lynn but to had to walk back to work each day to make dinner,switch the telly over and change nappies. Also, where I learnt to sail. Which is probably the only thing I have in common with Admiral Lord Nelson. Home of the University of East Anglia, motto ‘Do Different’ (including grammar, presumably – Malcolm Bradbury must have despaired). Winston Churchill visited Cromer in 1885 aged 11, and wrote home, “I am not enjoying it very much”. Rather brilliantly, North Norfolk District Council have had the quotation inlaid in a stone ring on the pavement of the promenade, using the specially-designed Cromer Prospect font. Thetford, Norfolk was the birthplace of radical activist and revolutionary Thomas Paine, author of Common Sense, Rights of Man and The Age of Reason. His rhetorical style was based on speaking as he found, and somehow being proud of it. Helped draft the American Declaration of Independence. Also gives his name to an award-winning pale ale brewed by Harvey’s, a brewery based in Lewes, where Paine once worked as a customs officer. It’s good stuff. Thetford was also the filming home of Dads Army. The war memorial on the A11 at Elveden has a replica of the European Cup on the top, you can see it for miles and there’s a lot of Roy’s in Wroxham. I was once eagerly anticipating 7 days on the local waterways. All booked by my dyslexic partner. Sadly we ended up with a week on the Norfolk B roads. The real AC/DC played The Pavillion, West Runton. AB/CD used to be regulars at The King Bill in Earl Shilton, I had a flat that backed on to the pub so I had free entry and free beer. Matthew Hopkins is still operating in some of the more remote parts. The police arrest people with shaving cuts. Norfolk and it’s golf courses are getting smaller by the day due to coastal erosion ..
Fine to drive whilst pissed at the age of 97.